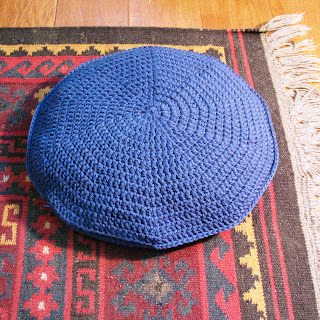 Here is a truly easy pattern for a large round pillow that can be used as a floor cushion or on the back of a big chair or sofa. Very cushy and comfy. Can easily be adapted for stripes or different sizes. Skill Level: EASIER THAN EASY! For lining, some sewing skill is needed, but not much. Yarn: About 880 yards worsted weight wool yarn (acrylic or acrylic blend would be fine too). Aran weight or 10 ply for UK and Australia. I used Kertzer Rejuvenation in a greyish bluish color. Hold 2 strands together throughout this pattern. Other Materials and Notions: About 1.25 yards coordinating fabric for the lining. 9 inch Zipper. Thread. Tapestry Needle. Pillow stuffing (I used a big sheet). 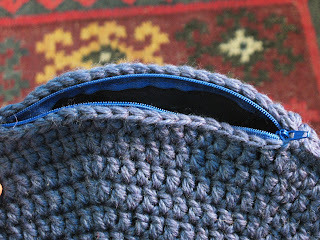 Note: To get a seamless look for each round I used a technique to start the next round that I learned from reading Lily Chin’s Crochet Tips and Tricks book (which is absolutely wonderful! Got me laughing out loud a few times – kinda unexpected from a crochet book! She is hilarious!). Normally you would start a round (or a row) of double crochet with a ch 2 (or some people would do a ch 3) that would count as your first dc. Instead, Lily suggests that you start the next round with a loose ch 1 that doesn’t count as anything, and then just do your first dc in the sl st from the join of the previous round. It really turns out nice and clean and it makes your joins almost invisible. My favorite thing about it though is it makes joining a breeze because instead of trying to join in the top of a ch, you are joining on the top of a dc. LOVE that! Hook: K hook. 6.5 mm. Gauge: Not critical. However to get about an 18 inch pillow - 12 dcs and 6.5 rows equals a 4 inch square. Fasten and weave in the ends. Lining: Fold fabric in half. Place the pillow on top and trace around it leaving about ½ inch for seam allowance. Cut out your two circles. With right sides together, sew around leaving a space for the zipper. Add the zipper following the instructions on the zipper package. (I still need to follow those instructions every time I do a zipper!) I find that it is a bit awkward doing a zipper on a round edge, but if you pin it carefully and sew slowly it will all work out! Just remember, the zipper seams will not show at all – it just needs to work. 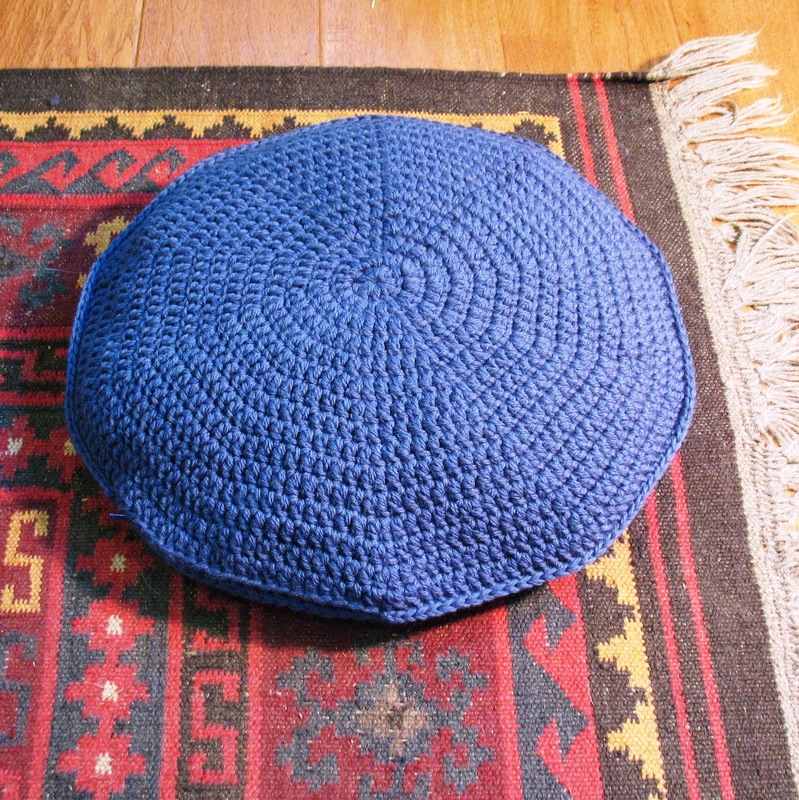 Finishing: Place the wrong sides of your two crochet circles together. Mark out the space for the zipper with tailor’s chalk or stitch markers. Sc around leaving the space for the zipper. Fasten and weave in your ends. Insert the lining in the pillow matching the lining opening to the pillow opening with the zipper open. Pin in place. Hand-stitch the lining to the pillow around the zipper opening with a coordinating thread. Voila! You’re done. I love your cushion! And thank you for sharing that fabulous tip for seamless rounds. I can't wait to give it a try - it sounds brilliant. Hope you're having a lovely week. I love this pillow and can't wait to try out this pattern! I am going to mention this pattern on my blog and of course mention you with a link! Wonderful! Thanks so much! I think it would be really great to do stripes or stitch the sides with a contrasting color. So many possibilities! I like the ability to make something where you notice only the pattern and the finished project, and not every single stitch or place where the rounds were "joined". It is a little confusing to do when you first start, but the end result is very nice and smooth. Looks professional... like someone took time to make it, and make it look nice. That's what everyone who crochets wants... others to appreciate what we did, not criticize our every single stitch and/or "mistake". Thank you for putting this up! Thanks! So glad you like the pattern (and the join method). I do this with ALL my projects now and am so pleased with the results. I don't think I'll over go back to chaining to start rows or rounds!